Parents often feel lost, frustrated, and powerless when their child is struggling at school. Although motivated by love and a fundamental desire to help their child, parents may be unsure why their child is having trouble and what steps to take in figuring it out. There are many reasons a child may be struggling, and, although these may be obvious in some cases, for most children the root cause is complex and not immediately evident. One underlying cause may be attention issues, which can result in academic problems, negative behaviors, and social difficulties. Academic performance is greatly affected by poor attention because it creates gaps in knowledge. In the classroom, new knowledge builds upon previously mastered material and, as the child progresses in school, gaps in foundational knowledge become increasingly problematic. Behavioral symptoms of attention issues can look very different for each individual child. For example, some children are disruptive, some stare out the window, and others present as engaged while, in fact, their thoughts are elsewhere. Since children in this latter group are not characteristically hyperactive and disruptive, they are at highest risk because their attention problems are least likely to be identified. In addition to academic and behavioral disruptions, attention issues can also result in social and emotional struggles. Children with ADHD are often socially immature and experience low self-esteem. A learning challenge may also be the culprit of low academic performance. A learning disorder is suspected when academic achievement is substantially below what is normal for age, schooling, and level of intelligence. Not surprisingly, learning disorders significantly interfere with school performance and achievement. Beyond failing grades, these problems can also cause demoralization, low-self esteem, and deficits in social skills. Children may become disruptive in class or simply “check out.” Furthermore, undiagnosed learning disorders can impact students into adulthood when they feel ashamed and “stupid.” As a result, personal relationships and careers may suffer. Contrary to popular belief, learning disorders are not indicative of low intelligence and do not assure failure; some of the greatest thinkers of our time are believed to have had learning and/or attention deficits. Social and emotional issues can also lead to academic problems. A child weighed down with sadness, anxiety, low self-esteem, and turbulent relationships is less likely to find the focus and motivation necessary to be successful on tests and assignments. Every individual expresses and deals with social and emotional issues in his own way – a reality which presents additional challenges to parents who seek to understand what is going on with their child. 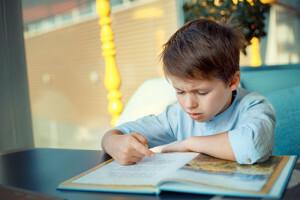 Many times a child’s difficulty at school is not due to a disorder or attention problem, but instead relates to a particular learning environment or style. For instance, children who are advanced in a certain area, but who are not challenged to the upper level of their abilities, are at risk for disrupting class, losing motivation, hiding their talents to fit in with peers, and developing an unhealthy view of why they are different. Sometimes a child simply has a different style of learning. For example, a visual-spatial thinker (someone who conceptualizes in images, and who sees “the whole” rather than organizing information into “silos”) learns most effectively when they understand the big picture first and can utilize their non-verbal abstract learning skills. Visual-spatial students also typically have “light bulb” moments when they grasp a concept all at once rather than in a step-by-step manner. Recognizing and capitalizing upon individual strengths and learning styles are essential for maximizing academic achievement and personal growth throughout one’s life. When attempting to understand the cause of a student’s struggles at school, a good first step is psycho-educational testing. Essentially, psycho-educational testing removes a great deal of guess work by distinguishing between “can’ts” (inabilities) from “won’ts” (behavioral choices), and by giving parents solid answers and direction. Results of testing reveal how an individual thinks and learns, information which can be used to offer recommendations based on cognitive, emotional, social, and behavioral functioning, as well as individual strengths and interests. Once parents clearly and comprehensively understand their child’s struggles, they can focus on promoting strengths, developing skills, seeking supportive learning accommodations, and collaborating with educators. Ultimately, the goal of psycho-educational testing is to maximize the child’s potential and lay the foundation for personal and professional success.